It was roughly a year ago, in the 6th of March of 2013, that the Portuguese newspapers released information about raids by the Competition Authority to more than 15 different banks. According to the information provided, the British Barclays denounced a cartel of which it was part in Portugal. Allegedly, banks have been colluding to keep the spreads high. With investigations going on it may still take more than a year for the Competition Authority to take a final decision regarding this case. The first question someone could ask itself is why Barclays denounced itself. The British bank has been involved in different scandals in last years, like the manipulation of the LIBOR, and the new CEO promises a policy of transparency and ethics. Nonetheless, the importance of the existence of a leniency program in Portugal cannot be ignored. By denouncing this cartel Barclays is exempt from any fine for having blown the whistle. The second, billion dollar question is whether we really have a cartel. Most people would be happy to scream “yes”, but more than from any knowledge this comes from an anti-banks feeling that has been on high levels since the beginning of the 2008 Crisis. Besides that, everyone would like to get higher interest on deposits and lower on loans, so it is easy to say that the current rates are not the product of competition. The data in this graph was taken from Banco de Portugal, the EURIBOR rate is for 12 months maturity. 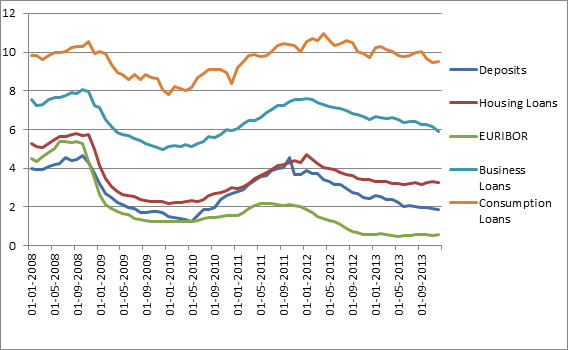 In the graph I distinguished three different types of loans (for housing, for companies and for consumption). This graph does show us how the EURIBOR is an important reference, and indeed most rates have followed the movements of the EURIBOR, making the affirmation of a cartel questionable. Nonetheless, the next graph may be more useful to assess this. The accusation is that the banks had a cartel on spreads. If true, this means that the banks agreed not to compete by reducing spreads to get more clients. We can see a similar pattern in all spreads, with a general decrease between 2010 and October of 2011. After this period the spreads start increasing. The difficulty in mantaining a cartel is the existence of an incentive to cheat on the promise of keeping the spread high, in order to steal clients from the rivals. 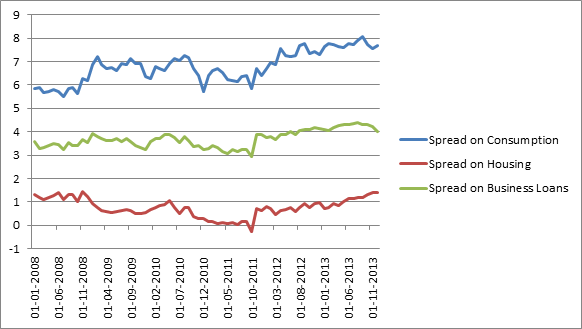 This decrease in spreads that occurs until October of 2011 is not very congruent with the existence of a cartel. Indeed, looking at this anecdotal data, if existent, the cartel would be posterior to this date. But notice that the moment of increase in the spreads coincides also with the moment in which the EURIBOR starts going down because deposit rates go down faster than loan rates. This could be explained by search models in which banks, taking advantage of quasi-rationality of people (or search costs), do not decrease loan rates so steadily immediately, because they can still get clients who did not inform themselves completely of the different rates of each bank. This could also explain the sudden increase in the spreads, because loan rates did not react to the EURIBOR decrease as fast as the deposit rates. On the other hand, the increase in spreads is already lasting for longer than search models would probably explain and are at the highest level of the last years. Actually, why would Barclays lie? It looks like it is not that easy to see whether there is a cartel or not. Even with such a simple analysis we already find arguments for both sides and with a more detailed analysis certainly a lot more points would arise. In the end it is up to the Competition Authority to find enough evidence of the existence of a cartel or not, but even with a denunciation there is still a lot of work to be done: just like in a race, when the whistle is blown there is still a whole race to run. In his blog post Filipe Silvério is touching upon the most important function of the European Committee Leniency program: affecting the expected payoff scheme of colluding companies. The increase in the probability of getting caught is the main driver here, and I agree with Silvério that without the Leniency Program, regulators might not have known about existence of the discussed cartels. I assume the mentioned decrease in expected profits (as result of an higher detection probability) is based on the Leniency Model. Although the successes of this model, I also consider it to be important to look at the drawbacks and will complement Silvério’s blog post with two of them. Another problem with the model referred to, is that it ignores the fact that the colluding firms have asymmetric information about the detection possibility. The detection possibility does not only depend on the effort of the regulator (which is ex ante known to all firms), but also on firm specific information available after the start of colluding. Self-reporting only occurs when the firm specific detection probability is high. According to Feess and Walzl (2004), the result of this is that having the possibility to self-report creates an option value that reduces the expected fine to be paid, and thus increases the payoff of colluding. This means that giving a self-reporting firm full immunity might not be without any costs. To summarize, I agree with Silvério and acknowledge of the importance of the Leniency Program. Nonetheless, the underlining model faces some disadvantages. Indirect or non-monetary costs of self-reporting are not taking into account, and asymmetric information creates an option value that increases the pay-off scheme of colluding. These drawbacks should not be ignored when using or analyzing the model. Feess, E. and Walzl, M. (2004), An Analysis of Corporate Leniency Programs and Lessons to Learn for US and EU Policies, University of Maastricht. Wallace, K. (2010), To Cooperate Or Not: Obtaining Amnesty Under The DOJ’s Corporate Leniency Policy, American Bar Association. After approximately 10 years of price agreements and other anticompetitive practices in the Dutch construction industry, Ad Bos, ex-director of one of the 344 companies involved blew the whistle in 2001. Although existing signs of these practices both the Dutch prosecution court and competition authority failed in investigating and terminating it. A whistleblower was needed to make the case relevant. This example shows the importance of whistleblowers, and how effective they can be. This article is a call for a financial incentive for whistleblowers in Europe and argues why we should not want to be without it. The European Commission underestimates whistleblowers. This is underlined by the way she explains how Article 101 (probation of anticompetitive agreements) cases start: “1) a complaint, 2) opening of an own–initiative investigation, or 3) a leniency application from one of the participants to a cartel.”  But what about whistleblowers like Ad Bos? An incentive program for whistleblowers would be a great additional fourth point here. While the British, Hungarian and Slovak antitrust laws have already included a financial incentive, the EU is still trusting in the moral incentive of individuals to do the right thing. This incentive program would basically include a cash payment given to first person that notifies the regulator of a horizontal or vertical cartel agreement and provides electronic or paper form proof. The whistleblower can than receive a payment of some small percentage of the penalties levied in the case, up to a certain maximum. Also, protection of identity by the regulator would be of great importance for the functioning of the program. A big advantage of this additional program would be the reduction in time of cartels operating. On top of the leniency program’s incentive of being the first company there is also an internal race for being first employee. Companies that consider applying for the leniency program have to take into account these anonymous employees that might want to make some extra returns as whistleblower. On the other hand, the existing burden in form of proof and risk that has to be taken is a good mechanism to avoid potential fake whistleblowers. One has to be fairly certain about his case before contacting the regulator. In the end, whether someone is telling the truth has to be discussed and decided on in court. A way to fight fake whistleblowers is to raise punishments for those who commit fraud by creating evidence for example. To conclude, given the concerns that policy makers have to cover before imposing this new program, the whistleblower incentive program can be an effective tool in fighting anti-competitive practices. It speeds up potential leniency applications, fills in a cap that is hard to fill in competition policy and on the other hand it gives employees a financial push in the moral right direction. Cartel in financial products: what was the role of the EC Leniency Program? Can I trust in my bank? No doubt you have heard someone asking this question before (and maybe you have already asked yourself about it). In the center of discussion of the recent financial crisis is undoubtedly the wrong practices carried out by the banks. However, even with the supposed end of the financial crisis, the reputation of the banks has been hit by several new scandals. For example, in the last December, the European Commission (EC) imposed a record €1.7bn fine on six firms (while two other are waiting for the final decision) for colluding to fix two key interest rate benchmarks. Let’s try to understand a little more. The EC found evidence of cartels operating in relation to both European interbank offered rate (Euribor) and the yen London interbank offered rate (Yen Libor). Essentially, the cartels were operating in the financial derivatives market, which are products used to manage the risks of fluctuations in interest rates. The derivatives are products traded worldwide which are valued from the level of a benchmark interest rate and are in relation to different currencies such as the Japanese yen, euro or dollar. Basically, the derivatives should reflect the cost of lending in a specific currency. The problem is that banks are supposed to compete with each other but they colluded, manipulating these interest rates for their own interests. At this time, it is quite possible that you are asking “how was the cartel discovered?”. Regarding the Euribor, the cartel, which operated between 2005 and 2008, was discovered because Barclays (one of the participants during 32 months) revealed its existence. The cartel which had been rigging yen Libor, in the period between 2007 and 2010, was disclosed by the Swiss bank UBS which also participated in that illegal practice. Now, the question is “why did they do that?”. As you know, cartels are illegal and therefore firms are very careful with possible traces which can lead to investigations. Additionally, for economic reasons, it is very difficult to determine what should be the competitive outcome of the market and there are several possible outcomes which are compatible with the collusive agreement. For example, if firms did not collude, what should be the interest rate? The answer is not straightforward and therefore the economic data can be unhelpful in those situations. The alternative is the use of a mechanism which complicates the creation or the stabilization of a cartel. One example is the so-called Leniency program. Just for the sake of curiosity, the first Leniency regime was introduced in 1978 by the US authorities, but only after its 1993 reform it became popular. Barclays and UBS revealed the existence of the cartel under the Commission’s 2006 Leniency Notice “whereby companies that provide information about a cartel in which they participated might receive full or partial immunity from fines”. JPMorgan (€79.9m), Citigroup (€70m) and the brooking firm RP Martin (€247,000) were also fined by the EC. Furthermore, Citigroup, Deutsche Bank, RBS and RP also saw their fines being reduced for cooperating with the investigation. However, this is not the end of the story. The British bank HSBSC and the French Crédit Agricole refused amicable settlement with the EC and therefore they will continue under investigation as well as the British broker ICAP. The answer to the last question requires another interrogation: “why now?”. This answer is not directly given by the facts, so we should think a little bit. In this interesting case-study, the details should not be forgotten: both Barclays and UBS have already been fined for other cases and by different authorities. In particular, in 2012, the British Financial Services Authority fined Barclays by their attempt of manipulation of the Libor (for example, with false reports). The bank has also accepted a settlement with US Department of Justice and with the US Commodities Futures Trading Commission. In total, they had to pay a record penalty of €440m. The case of the UBS is even more impressive: they were fined a record €1.1bn by the US, British and Swiss authorities. As their misconducts were discovered, both banks were afraid of future investigations. They knew that European authorities would take more attention to their practices and therefore the probability of the cartels being discovered increased substantially. Consequently, the expected profits of being in the cartel (or in those cases, of hiding the extinct cartels) decreased and the reductions were so large that they become lower than the expected profits of being the whistleblowers. Of course, the leniency program was determinant: banks need to have an incentive to reveal the cartels (in this case, full immunity for the whistleblowers). To conclude, the leniency program was very effective in the sense that the EC sanctioned the existence of those cartels. However, in this case the EC did not stop the cartel: when the EC investigations were finished, both cartels were already extinct. Naturally, we cannot forget the effects of previous investigations which also contributed to decrease expected profits of hiding the cartel. Although they may have some limitations (this would be subject to another post), leniency programs are undoubtedly an important tool in the fight against cartels. This is why a growing number of countries have now Leniency programs. Categories: Cartels and tacit collusion, Competition Policy, Economics | Tags: #competition #policy #economics #barclays "banks #ubs #law #antitrust #EC | Permalink. Is the Leniency program enough? Economics have provided some intuition on how to minimize risk for collusive behaviour among companies. This is crucial in a good functioning market, as cartel formation will have as a result the maintenance of high prices, low quality (so as to decrease costs), or other situations that will result on increasing profits, decreasing consumer surplus and overall decreasing welfare. Furthermore, it is important to understand the difficulties associated with finding a cartel, as normally these situations are carried out on tacit agreements, and many times there are no proofs to speak of. Policymaking has targeted this problem as one of great importance to avoid, and it is in this context that the leniency program emerged. Basically this program consists on giving incentives for firms in a collusive situation to go forward and admit it, as no fine whatsoever will be given to this firm. In contrast all the others would be heavily charged. By reducing the costs of “snitching”, firms will be more prone to do it and if so, the collusive behaviour will cease. Moreover, as it will make the likelihood of the cartel to be discovered higher, (as incentives are given for some of the firms to declare their behaviour), therefore the costs of the cartel, even if no one snitch, increase. This program has been the number one cause of cartel discovery in numerous countries, but is it enough? In many private enterprises managers income is correlated with the well being of the company, furthermore management is a very reputation wise profession – if they have been managers of a very profitable company they will likely receive admirable offers, making them prone to do everything on their reach to increase profits. Although all off this, they do not internalize all the cost and risks of their actions, and may well be that they see a cartel as a nothing to loose chance, (if they believe that in few years they will work somewhere else for example, and the cartel will not be discovered until then). We should also add in this analysis, that with this program, a cartel is probably only sustained if it has enough gains to overcome the high costs of being caught – so only the most profitable cartels will endure, and probably these are the cartels with most distorting effects. In some countries, the CEO’s of a cartelized company, in the event of discovery of the collusive behaviour, will go to jail – cartel is criminalized. If the CEO’s believe that if they get caught in a cartel they will go to jail, the likelihood of ongoing in a cartel is smaller, as they will then internalize the costs and risks of the cartel. This allied with the leniency program would reduce even further the probability of cartel sustaining, and now not all the sustained cartels that resulted in higher profit would be sustainable, as this would further depend on how risk lover was the manager. But there is a problem in this reasoning: for each crime a proportional penalty should be applied. There are people who defend that prison would be too much. But if I consider that in an illegal way the company is creating a DWL, that without the cartel would not exist, then the cartel is “stealing” part of the economy. It is also appropriating of some consumer surplus. If a guy that steals bread should go to prison, why can’t a manager that “steals” from all the consumers? Categories: Cartels and tacit collusion, Economics | Permalink. Cartels are made and can be sustainable if there are no incentives to deviate. The incentives to do not deviate are possible either by explicit agreements, where firms agree on specific written rules, or by implicit agreements, also known as tacit agreements. The first one is illegal. In this sense, what is the point on make an explicit agreement? Indeed, the rules are written and there is no possibility of misunderstanding the rules. However, if there is an incentive to deviate, what can impede a firm to do so? There are rules, but these are illegal, as well as the practice of collusion. In fact, in general, these agreements, decisions, and practices are invalid, which means they cannot be used to coerce any party to comply with what is stipulated therein. In collusive practices are usually involved fixing market conditions. Cartels usually involve parallel behavior by the companies, being this behavior behind the exchange of information between these companies. One of the cartel cases most observed is the simultaneous and identical increase in prices. For instance, in Portugal, one of the most recent news concerning the subject was the searching of Portuguese banks for suspect act in cartel, where apparently there was a complaint of Barclays in this sense. It is suspected that the banks acted in cartel, by combining the values ​​of spreads and commissions. The competition authority states that the searches are related with the verification of evidence of exchanging sensitive commercial information on the domestic market, which underlies suspected infringements. In Portugal, as almost a translation of Article 81 of the European Union Treaty, the article 4 of the new Competition Act (Law 18/2003) establishes the general principle of the prohibition of cartels between enterprises. The principle states that “are prohibited agreements between undertakings, decisions by associations of undertakings and concerted practices between undertakings, whatever form they, which have as their object or effect of preventing, distorting or restricting competition appreciably in whole or in part of the national market. To conclude, it is unlikely to be found explicit agreements, nevertheless their existence will always be illegal under the existing rules. Moreover, although some cartels have had some long-term success, the majority of them are unable to affect in a substantial way the prices in the long-term. In present it is possible to punish only companies for cartel’ agreement, their managers are not threaten by sanction. If a new law in Czech Republic is approved by the parliament unchanged, the managers can be threaten by 3-year prison and prohibition of activity for an active presence in anticompetitive acting. The new punishments would concern only so called horizontal cartels, thus, the agreements of pricing or dividing of market among direct competitors. According to ÚOHS (Czech authority for competition policy) the horizontal cartels are the most dangerous way of restriction of competition and they lead to the increase in prices for final consumers and to the deterioration of choice of good’s quality. The abuse of dominant position, not allowed connection of companies and even anticompetitive agreements among suppliers and purchasers will be not threaten by prison. The chief of ÚOHS thinks; that the new punishments for managers will not have a negative effect on a Czech business. The new punishments are focusing only on the hardest and intentional cases of disruption the competition. So the Czech managers would not be threaten by the punishments for unintentional mistakes or not so huge offences against competitive rules. The punishment for anticompetitive acting is quite common in the European Union. Germany, France, Great Britain, Estonia, Romania or Slovakia have it in their law too. In the USA there was also a tightening in the punishments for cartels three years ago. The managers, who are directly participate on a cartel’ agreement, can spend in the prison even ten years. The uncovered cartels were punished mostly with fines in the Czech Republic until now. Last year ÚOHS fined for example bakery companies Delta, Odkolek and Penam, which arranged the prices of bakery products. The most important case until now; was the cartel of sixteen international industrial companies. This cartel was fined with the 942 million crowns (cca 36,2 million €). The ÚOHS uncovered this illegal agreement due to the cooperation with the ABB company, which participated in the cartel. It was under the leniency programme, ABB confessed the participating in cartel and presented evidences about illegal agreements. Because of this, ABB avoided to the fine. In my opinion this process is really appropriate because the number of cases of companies connecting together is still high and it is necessary to investigate every connection in order not to harm the consumers by distorting how the market operates. In January 2010 the Norwegian asphalt giant Veidekke approached the Norwegian Competition Authority(NCA) with information clearly stating that their company had been involved in price-agreements with another company. The other company involved was NCC, a swedish construction gigant which also has a big market share in the Norwegian asphalt market. The reason for Veidekke having an incentive to disclose such information with the competition authority was of course the leniency law, which was introduced in Norway in 2004. This law states that a firm can avoid getting the punished for participating in illegal cooperation with other firms if it is the first to disclose information of this cooperation to the competition authority. In effect this law builds on the classic Prisoner’s Dilemma. A firm knowing that the other part of an illegal cooperation can foreclose information of the activity to the competition authority and get away without any punishment has a strong incentive to be the first to come clean with the information. Furthermore the dynamics of the system incentivizes firms to never go into any cartel activity since the likeliness of keeping the activity secret is very low. In the Norwegian asphalt case the area which was in question was a counties of Sør-Trøndelag and Nord-Trøndelag, which is approximately half of the size of Portugal. The companies had split the area between them in a way such that the each company got the areas that were geographically located close to it’s asphalt factory in the county. The agreement of course involved not bidding on each others areas, so that each company would get a higher price from the public contracter which was the local municipality of Trondheim and Statens Vegvesen. When Veidekke approached the NCA they presented evidence of meetings at local Statoil stations, messages of contact between the district leaders of the two companies and some other information. The NCA after a while judged that NCC would pay approximately € 22 million and that Veidekke would pay € 36 million for breaking the illegal price cooperation. However, because of the leniency law Veidekke ended up paying nothing for breaking the competition law. The leniency law is very untypical for Norway. In the asphalt case the company that had the worst violations of the competition law was the one that got away without paying for its crime. Many have questioned the fairness of the leniency law, pointing out that it represents a more “American” solution to the problem than we would prefer in Europe. Nevertheless one might ask oneself, would this kind of well-executed cartel activity be uncovered without the existence of a leniency law? In 2001, the European Commission imposed record fines of €855.2 millions to the members of the Vitamin Cartel. The cartel, formed through collusion between thirteen companies operated for a decade (between September of 1989 and February of 1999) mainly by fixing the prices of vitamins. There were also agreements on the following: the allocation of volumes of sales and market shares for specific vitamins, the division of contracts to supply vitamin premixed to customers in the U.S., and the participation in meetings to both monitor and enforce adherence to the previous agreements. This enabled the companies to set relatively high prices without losing market share. 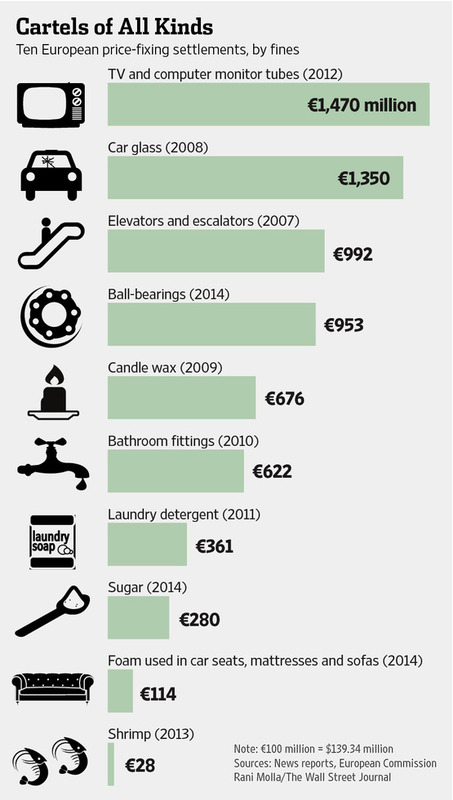 This hurt consumers as prices would have been lower if the environment was more competitive. Moreover, it hurt other companies that used vitamins in their production process, and their respective consumers. Suspicions of anti-competitive behavior first emerged in 1997 and, two years later, the U.S. Department of Justice formalized the complaint following thorough investigation. Later on, the EU decided to launch a similar investigation. International cartels generally develop because the right dynamics are in place. In this case, these included the fact that the vitamins market was very concentrated (with very few players) and had high entry barriers due to the required big initial investment, as well as the fact that vitamins are a commodity and therefore are harder to differentiate (which allows the companies to uniform their prices more easily). The fines attributed to each company depended mainly on the infractions committed and its role within the cartel, and whether or not it had cooperated with the competition authority in its investigation. In the EC case, Aventis SA benefited from having been the first company to cooperate and, therefore, was granted complete immunity in its participation in the collusion regarding certain vitamins (but not all of them). The giants Hoffman-La Roche and BASF AG also cooperated and their fines were reduced by 50 percent. Yet, they still received the largest fines (€462 and €296.16 millions respectively) due to their crucial roles within the cartel (the former was the leader). Finally, five out of the thirteen companies had been involved at least five years prior to the investigation and, thus were immune. Is this type of punishment enough to discourage cartels? Firstly, it is important to note that rational companies would only participate in a cartel if they were convinced that the benefits enjoyed would outweigh the future potential costs of being caught and fined for it. Since there are legal limits in terms of how much a company may be fined, cartels could more or less easily calculate this trade-off and, subsequently, decide whether to participate or not. In theory, this means that some cartels probably will see benefits from engaging in collusion even if they get caught eventually. Thus, it could be argued that penalties are not enough to prevent cartels from (re)emerging. In the case of the vitamin cartel, its price mark-ups of 20 percent allowed it to gain billions of dollars, which is more than what it paid in criminal fines. This sends the message that it is still beneficial to engage in collusion. A suggestion would be, for instance, to compel the involved companies to split from their subsidiaries, as punishment for having destroyed most of their local competition. This type of structural relief could, eventually, result in more competition emerging in the vitamin market. The Czech authority for competition policy (ÚOHS) would like to focus more on penalizing tacit agreements among candidates of public contracts. A planned revision of a law for protection of competition is supposed to enable a more dynamic procedure against such agreements. These practises are often associated with corruption and they are also well organised. Tacit agreements among candidates of public contracts are also known as bid rigging. Now I would like to explain more this concept. Bid rigging can have many forms. It can be for example an agreement which includes who will present „the best“ price offer in the competition. „The lowest“ price, in that case, can be about ten percent higher than the real value of execution of a contract. However, tacitly colluded candidates present their offers in this way, so that the others seem to be even more expensive (so called covered offers). The contract owner will choose the lowest one, still a quite high price. In the next public contract, candidates will change and somebody else will offer a seemingly lowest price and so on. This type of offers is the most often way bid rigging is implemented. In practice the presention of covered offers can be the following: a candidate agrees with presenting of an offer, which is higher than the winner’s offer, determined in advance. Or the candidate presents the offer, about which he knows that it is too high to be accepted; the candidate can also present the offer, which includes special conditions, about which he knows that they are unacceptable for the contract owner. The covered offers are in these cases used in order to create the semblance of authentic competition. This way can be combined with the resignation of the winner of the competition, who, for example, states that he is not able to realize that contract due to lack of capacity or other reasons. Then the other firm will get the contract for the bid price, which is much more higher than the price estimated by the contract owner and also than the real price of the contract. The antitrust authority wants to defend against these tacit agreements through a planned big revision of the law for protection of competition. The candidates convicted from this kind of agreements will face not only the fine but also, for example, the loss the access to public contracts for three years. The proposal also expects that the company that will state the tacit agreement to the antitrust authority in the moment, when nobody knows about it, can avoid to the fine. I think that there is really necessary to do something with that, especially in the Czech Republic, because the Czech Republic belongs among the countries where the situation is really bad according the Transparency International. For example public contracts in Czech Republic swallow 650 millions crowns (cca 25 millions €) up. The bottom border of estimate the overpricing of public contracts, mostly in the sectors like construction, information technology, consultancy or legal services and of that what will „get lost“ on the way, illegally in private pockets, is between 10 % to 20 %. As we can see the larger intervention is really necessary and we can hope that the situation will get better with the revision. Rome-Milan: competition finally worked out! The availability of the high-speed train followed by the entrance of new competitors both on the long distance train and on the Fiumicino-Linate route, significantly benefited consumers, both in terms of prices and of quality. The Milan-Rome route – with more than 30.000 spots available daily between train and plan – is a crucial part of the Italian transport network as well as one of the most profitable in Europe. Before the completion of the high-speed train line, the two means of transport constituted two different markets. Indeed, with a travel time of five hours, the train service, provided by the state-owned monopolist Trenitalia, was not convenient for round journeys during the same day. Therefore, time-less business clients preferred the plane. Targeting mainly this segment, airlines working on that line managed to make relevant profits. Such that, the route was considered the golden goose of the Italian – if not European – air transport market. In spite of the significant profits it was making on that route, Alitalia was not in a good shape. In order to tackle its financial distress, the Government set a complex and controversial operation – Operazione Fenice. This plan included the merger with the second Italian airline, Airone, basically the only other player on the Fiumicino-Linate route. Therefore, in order to conclude the operation, the Antitrust Authority (AGCM) did what it had been asked to do: allowing a monopoly for a limited period of time. In the meanwhile, the various parts of the high-speed railways were being completed and the travel time fell significantly, up to three hours at the end of 2009. Just a couple of years later, the private company NTV entered the long-distance-high-speed-train market and immediately exerted a significant competitive pressure on the former monopolist. The outcome was a considerably cheaper as well as better service. The features of the new train service reduced the gap with the plane. Thus, some competition between the two means arose as well. Nevertheless according to the AGCM, the cross elasticity between the two services was not enough, especially during the more profitable periods of the day, early morning and late evening, that allows for a round trip in the same day. Furthermore, having no access to Linate slots, Milan City Airport, the other airlines cannot actually compete with Alitalia. Therefore the overall competitive pressure was by far too weak. Coherently, starting from October 2012, Alitalia has been forced by the AGCM to dismiss some of its slots in order to let another player, the English low-cost company Easyjet, enter the Fiumicino-Linate route. Categories: Cartels and tacit collusion, Competition Policy, Economics | Tags: Antitrust, competition, Italy, Mergers | Permalink.